Ground Penetrating Radar is often used to determine the presence of any underground storage tanks. We recently were scanning a old service garage in New Jersey to determine if there were any abandoned tanks or lines in the sub-grade. Through the process of taking scans on one foot centers in a grid pattern we found several combinations of connecting reactions. Our project manager detected a deep circular disturbance about 20” wide that was connected to a pipe that would lead to a steel plate embedded into the slab. We found this pattern several times in the service garage. The owner of the garage was on site and made and recalled that the original garage used a piston system to elevate vehicles in the service garage. 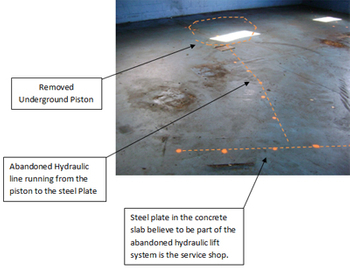 With the technology of GPR we were able to determine the location of the old pistons, and the lines that connected them to the hydraulic lifts. In this instance we were able to confirm that the pistons had been removed and there were no longer any UST or pistons below the surface. In the picture to the side you can see our markings where there used to be a below ground piston, and the line the leads to the steal plate which was part of the hydraulic lift system. All the data was collected by Ground Penetrating Radar Systems, LLC.